These giant dust storms seen at the equator on Titan rise as far as 10 kilometres above the surface. Mars and Earth are no longer the only worlds in the solar system where such phenomena are known to occur. We put three questions to Sébastien Rodriguez, a planetologist at the IPGP global physics institute in Paris and lead author of this discovery published in the journal Nature Geoscience on 24 September. Artist’s impression of a dust storm on Titan. Credits: Ron Miller. How did you discover these dust storms? Sébastien Rodriguez: Thanks to our database of bright spots observed in the infrared by the VIMS instrument (Visible and Infrared Mapping Spectrometer) on the Cassini probe. Most of the more than 300 spots in this database are clouds of hydrocarbons, which are well known and recorded. But three of them caught our attention, as they clearly stood out from the rest, notably because of their unusual pinkish colour in the infrared, their location above dune fields at the equator, their timing (at the equinox between 2009 and 2010) and their short duration (between 11 hours and five Earth weeks). We explored all hypotheses to solve the mystery of their origin. Were these strange bright spots linked to surface phenomena like frozen methane rain or icy lava, both potentially very bright in the infrared? Were they being caused by atmospheric phenomena like liquid methane clouds or, more unusually, solid particles? 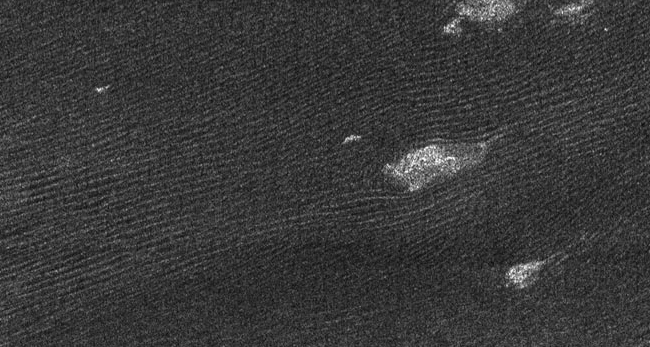 The only plausible explanation was that these spots are the infrared signature of giant clouds of dust rising from dune fields at Titan’s equator. The three pink bright spots seen by the Cassini probe in the infrared. Credits: NASA/JPL-Caltech/University of Arizona/University Paris Diderot/IPGP/S. Rodriguez et al. 2018. So what are these dusts made of? They’re tiny solid particles of hydrocarbons whose exact composition is still unknown, formed of carbon, hydrogen and nitrogen (and possibly small amounts of oxygen). Experiments in the lab have shown they could be similar to organic soot, with a brownish hue, a bit like hydrocarbon particles produced by car exhaust or industrial pollution, only here they’re being produced quite naturally! On Titan, these particles form very high up in the atmosphere as a result of a series of complex chemical reactions involving carbon and nitrogen molecules present in abundance. These aerosol particles eventually rain down to the surface of the moon, where they’ve been building up a thick layer of sediments for hundreds of millions of years. We believe these particles are what form the dune fields at Titan’s equator. Is it likely that very strong winds are raising these organic clouds of dust on Titan? Yes, and that’s without doubt THE biggest surprise our research has uncovered. To raise such amounts of dust up to altitudes of 10 kilometres, we’ve calculated that the winds blowing on Titan must be very strong, at least 2 metres per second (7.2 km/h). That’s almost five times stronger than the surface winds measured by the Huygens probe in 2005. It’s also a lot more than what most climate models of Titan have predicted. The most probable explanation is that these strong and fleeting winds are coming from powerful gusts at the front of huge methane storms. This is analogous to the well-known mechanism of “haboobs” seen on Earth, with giant dust clouds preceding storms in arid areas. The existence of such strong winds generating these massive, albeit fleeting, dust storms also implies that the underlying sand can be set in motion, too, and that the giant dunes covering Titan’s equatorial regions are still active and continually shifting, like those on Earth and Mars. Besides these strong winds, it’s also possible there are active dunes even on this faraway icy moon that is just full of surprises! 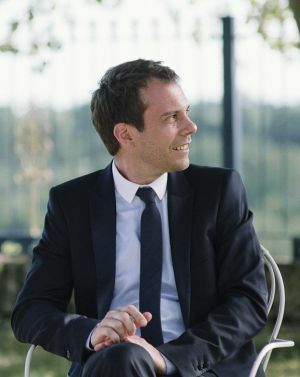 Sébastien Rodriguez, planetologist at IPGP. 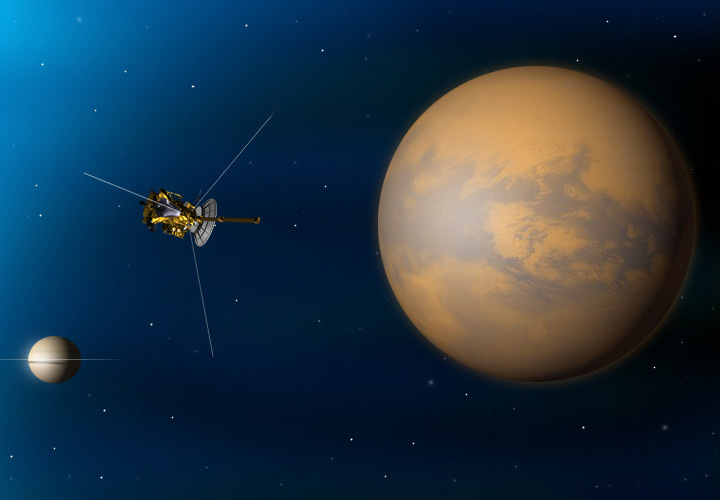 Artist’s impression of a flyby of Titan by the Cassini probe. From 2004 to 2017, Cassini flew by Saturn’s largest moon once a month on average. Credits: NASA/JPL-Caltech. Dune field discovered on Titan in 2005 by Cassini’s radar. The white spots are not clouds but topographic features. Credits: NASA-JPL. 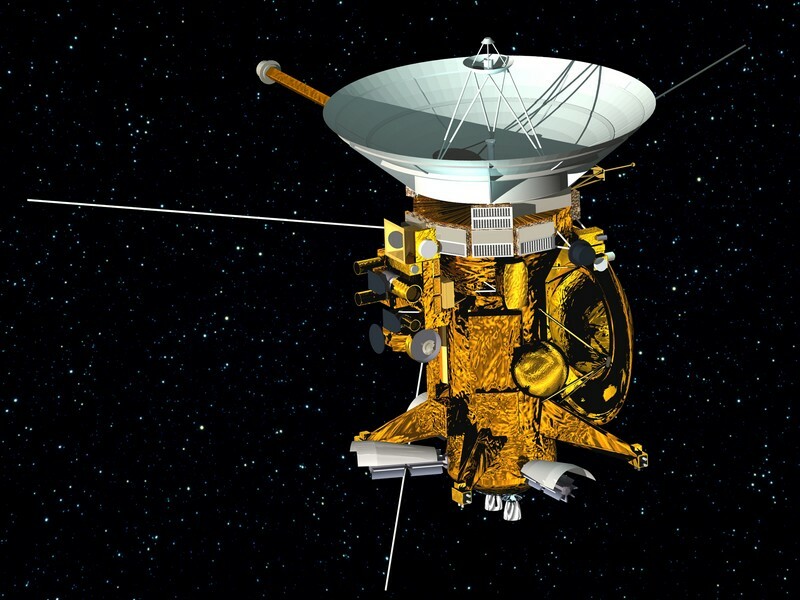 The Cassini-Huygens mission is an international partnership between NASA, ESA and ASI, the Italian space agency. CNES was involved in developing half of the scientific experiments on the Cassini orbiter that plunged into Saturn’s atmosphere in September 2017. Today, CNES is funding post-doctoral research to process the data from the mission. Some of the research scientists are working in Sébastien Rodriguez’s team.